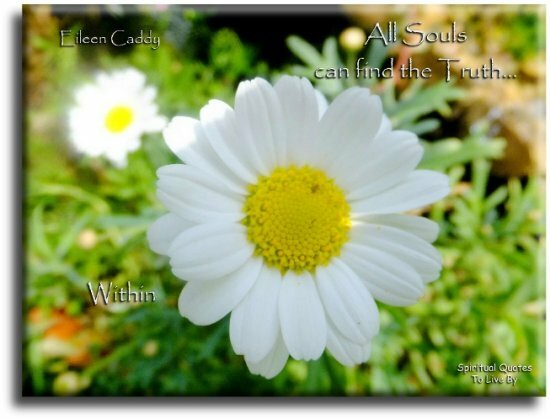 Eileen Caddy was a spiritual author, teacher and also one of the founders of the Findhorn Foundation, a New Age community that began in 1962 and is now home to over four hundred people and has thousands of visitors from all over the world. 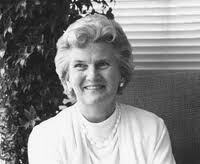 Eileen Marion Jessop was born on 26th August 1917 in Egypt, her mother was English and her father Irish. At six she was sent to stay with an aunt in Ireland so that she could go to school there, returning for holidays. At sixteen her father died so the family moved to England where only two years later her mother also died. In 1939 she married Andrew Combe, they had one son and four daughters. In 1953 Eileen asked for a divorce as she had fallen in love with Peter Caddy who she had met through her husband. Andrew would not let her see their children and it was at this point in her life that she visited a sanctuary in Glastonbury where while meditating she first heard the voice of God, which was to become her inner guidance that she taught was within us all. Eileen and Peter were married in 1957 and by 1968 had three sons. In November 1962 Eileen, Peter and a friend Dorothy Maclean moved to a caravan park near the village of Findhorn in Scotland. Due to unemployment they started to grow their food. With the spiritual guidance that they received they were able to grow amazing crops on not very good soil which soon attracted media attention. 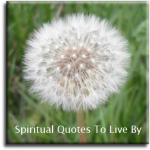 It wasn't long before a 'New Age' spiritual community began to develop, which has continued to grow over the years. 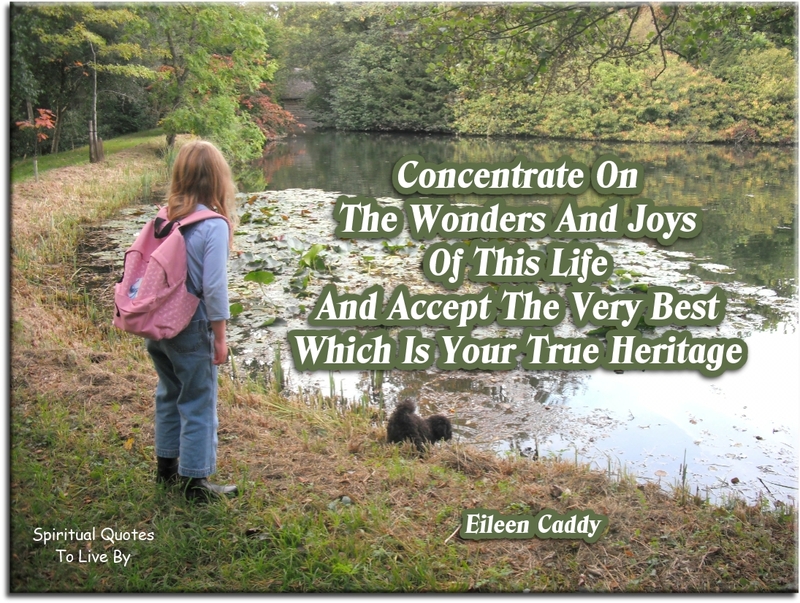 In the 1980's onwards Eileen Caddy wrote several books and travelled across the world speaking at Spiritual events. 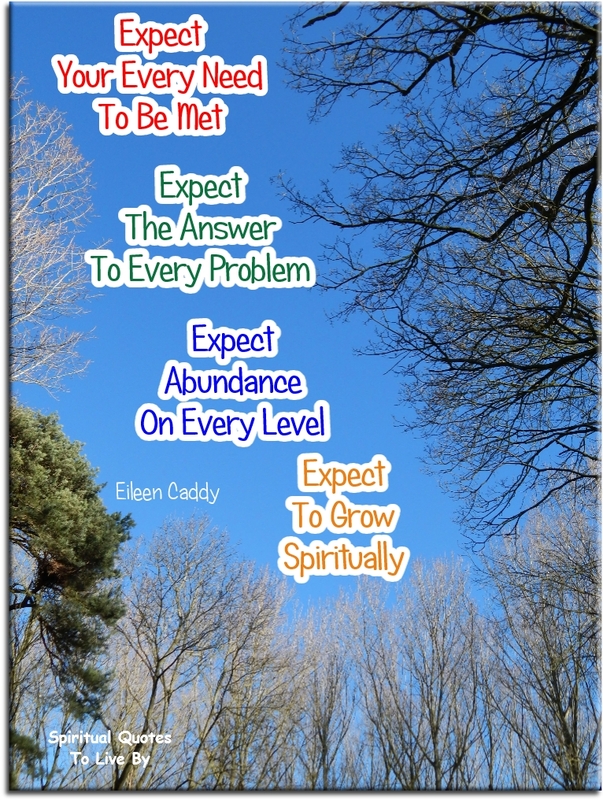 In 2004 Eileen was awarded the MBE for services to spiritual inquiry. 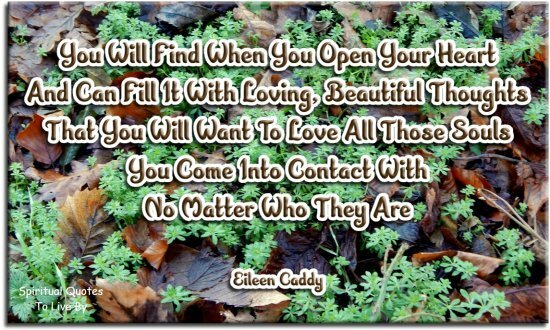 Eileen Caddy died on 13th December 2006 at Findhorn. All Wisdom, All Power, All Strength, All Understanding. Be still and you will know the truth; and the truth shall set you free. Difficulties are opportunities to better things. They are stepping stones to greater experience. Perhaps someday you will be thankful for some failure in a particular direction. When one door closes another one opens...as a natural law it has to balance. Dwell not on the past use it to illustrate a point then leave it behind. 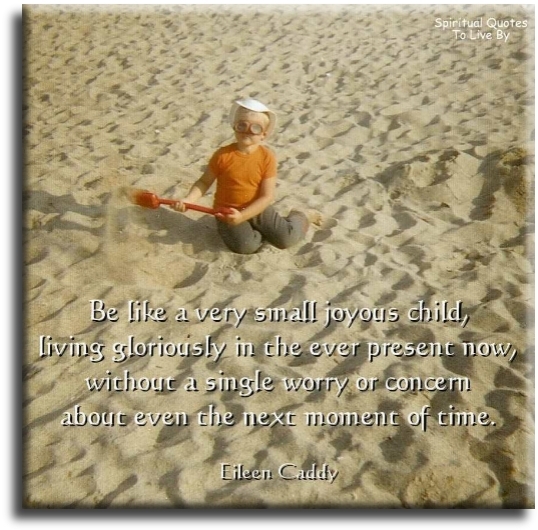 Nothing really matters except what you do now in this moment of time. From this moment onward you can be an entirely different person, filled with love and understanding, ready with an outstretched hand, uplifted and positive in every thought and deed. 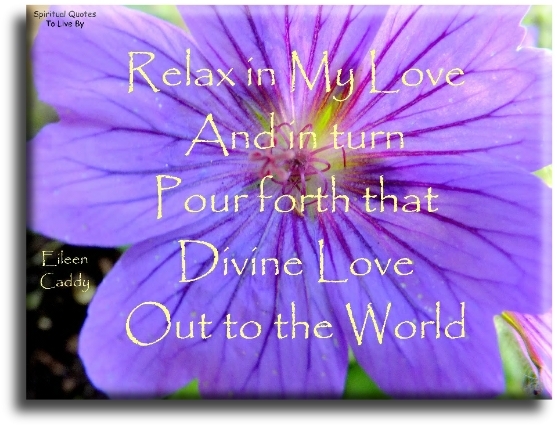 Let My Peace and Love infil and enfold you. 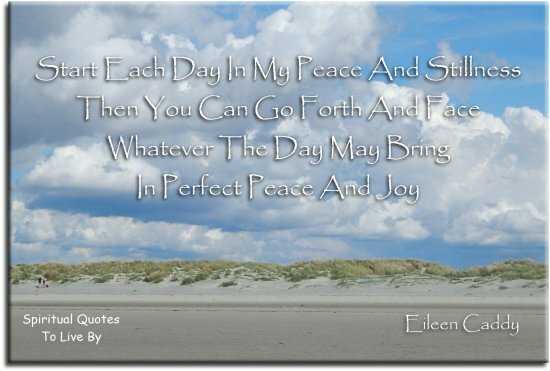 Let my peace which passes all understanding infil and enfold you, for when you are at peace within, you reflect peace without, and all those Souls you meet will feel that peace. When a cupboard is full to overflowing and the doors are opened up, that which is within comes tumbling out and nothing can stop it. When floodgates are opened, the water rushes forth with tremendous power and force, carrying all before it. So with the spiritual power within you; once it has been recognised and released, nothing can stop the flow. It pours forth, sweeping aside all negativity and disharmony, bringing with it peace, love, harmony and understanding. It is love that will overcome the world; it is love which will unite humanity. Therefore the sooner you release that tremendous power of love within you and allow it to flow freely, the sooner will you behold world peace and harmony and the oneness of all humanity. 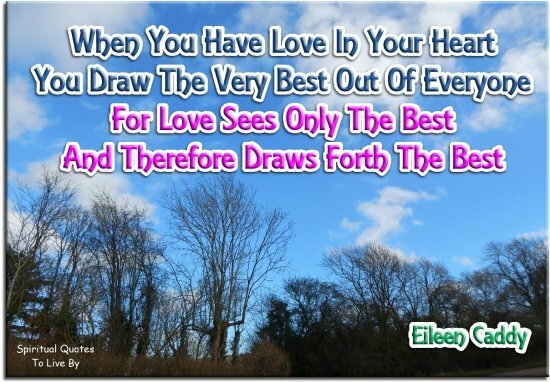 When you have love in your heart, you draw the very best out of everyone, for love sees only the best and therefore draws forth the best. Be not afraid; open up, hold nothing back, and let it all flow freely.